My Orange Brompton: My Name is Orange Brompton...I am an addict!? What a way to title a blog entry I hear you say in between sharp intakes of breath. Have no fear dear reader, I have not taken to illegal substances. I refer to a subject I have touched on before, namely, cycling addiction. There is a very potent force at work with regards cycling. I have to say that it is the longer, more challenging rides that seems to be able to take hold and not want to let go. There must be some form of pleasure derived from heading off to Hyde Park Corner at a time when most sensible people are going to bed and cycling for hours to the seaside. Some might even say that it was a crazy notion. In fact some of my work colleagues and family actually do think I was mad to embark upon this merry sojourn! A look back at the week leading up to this particular ride perhaps provides an insight into whether or not I am indeed an addict. In the preceding few days I was looking forward to Friday. A preoccupation with what the weather might be like on Friday night/Saturday morning made me think of what I would wear. In fact I had a number of outfits ready and waiting for a number of possible weather scenarios. Packing light was given great thought and deliberation. The prospect of rain or chilly conditions brought me to the conclusion that my Altura Night Vision jacket was too heavy and bulky to carry. This induced to me bring forward the purchase of a 73g Pearl Izumi Pro Barrier Lite jacket (which incidentally served me very well). When doing the food shop I bought some oat/fruit filled bars so that I could graze as I cycled along, happy in the knowledge that I would not run out of fuel. On the subject of food, a couple of days before my main meals consisted of pasta and the week leading up to this ride I drank lots of water throughout the day. When Friday arrived it was an incredibly busy day at work and I didn't have a moment to allow my mind to wander too close to thoughts of this ride and what an adventure it might be. However, upon leaving work I could not help but think of the big event later on. I deliberated upon which bike to take with me and eventually went for my Titanium Orange Brompton due to its considerable weight saving. Finally heading off to the meet up point I was nervously excited. I have tackled night rides before. I have ridden further. I have tackled very steep inclines and yet this ride felt different somehow? In the small hours of Saturday morning, in darkness and only the moon and collected bicycle lights to illuminate our path, I was thoroughly enjoying it. The effort and stresses of going up steep hills was dare I say it, pleasurable. The prospect of the ultimate challenge - Ditchling Beacon - was not something to be afraid of...it was something to look forward to. Having completed the ride I was on a high as it had been a great experience. On Monday morning when I took my Orange Brompton out on its daily commute to work I felt slightly maudlin. I wanted to go through the preparation again. I wanted the excitement...anticipation of going to the meet up point. I wanted to cycle into the night. I wanted to push myself to the limit. I wanted to do it or something like it again. I will be going on lots of rides similar to this and I look forward to them greatly but I can only come to one conclusion. 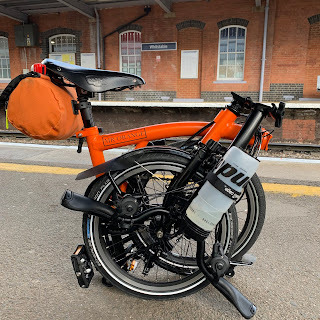 My name is Orange Brompton and I am an addict?